"A very quick and easy fix to a tasty side-dish. Fancy, designer mac and cheese often costs forty or fifty dollars to prepare when you have so many exotic and expensive cheeses, but they aren't always the best tasting. This recipe is cheap and tasty." Melt butter in a saucepan over medium heat; stir in flour, salt, and pepper until smooth, about 5 minutes. Slowly pour milk into butter-flour mixture while continuously stirring until mixture is smooth and bubbling, about 5 minutes. Add Cheddar cheese to milk mixture and stir until cheese is melted, 2 to 4 minutes. 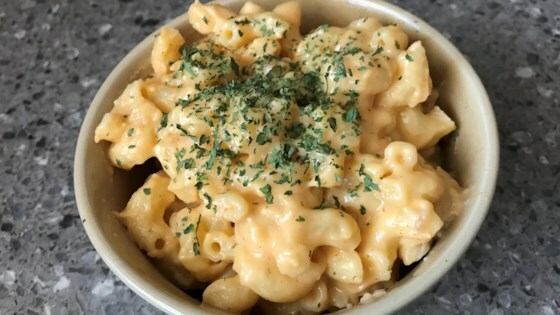 Creamy, decadent macaroni and cheese to have for a meal or a tasty side dish! You can never have enough cheese, and I usually add an extra half cup without ruining the recipe. Keep a careful eye on the milk when boiling, as milk boils fast and burns easily. Burnt milk will show up in the recipes flavor if overcooked. I think this is an awesome staple recipe. It can be tweaked for individual preferences. I added onion powder, parmesan cheese and a little bit of cayenne pepper.